It doesn't matter if you are a full time tree feller or part time arborist, we have all the replacement chainsaw parts you need to keep your saw cutting, tree after tree. Our wide selection of genuine replacement parts and aftermarket chainsaw parts for all major brands means we carry the parts you need. Our large warehouse inventory and extensive parts sourcing network allow us to fill orders fast. Get some of the best pricing on the web for genuine replacement chainsaw parts when you order from RCPW. Don’t waste any time this season, keep your saw cutting like a champ and get your parts fast! Have your chainsaw part number ready? Search for it above to find the replacement chainsaw part you need! RCPW carries a large selection of replacement chainsaw parts like bars, chain, sprockets, handles, carburetors and more. 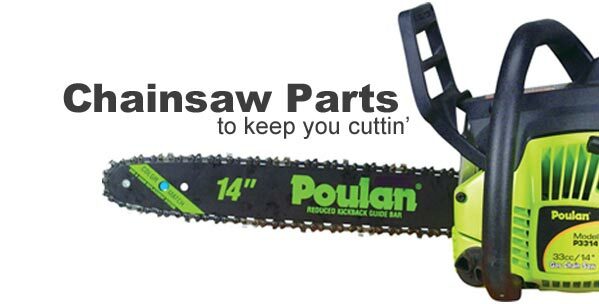 We carry chainsaw internal engine parts as well so you can work on your chainsaw and get all of your parts from RCPW without having to go many different places to get all of the parts you need to fix it. If you can't find the right replacement item, call us at 800-937-7279 or use our free parts lookup.